Looking back on our incredible bike holidays on Gran Canaria last year, we were not too optimistic to surpass that experience when mountain biking Menorca. First, we wanted to go to Gran Canaria again, but as our friend´s house was already fully booked we were up for a new impression. Again, inspired by the TrailNinja we chose the Camí de Cavalls (horses path) around the island of Menorca in the Mediterranean Sea. Here you can read about our planning advices and the best way to almost end up in jail on Menorca! Those who read the article from last year already know it is very useful to compare prices for flights not only on the internet. And again, the best offer came from a local travel agency. In addition, they recommende us to buy a bonus card from the airline, that includes the free transport of one piece of sports luggage. During the planning phase for mountain biking Menorca we collected multiple GPS tracks from different portals (Outdooractive, GPSies,…) and started drawing our own GPS tracks for the trips. In parallel we looked up accommodations in the towns we wanted to stay. Regularly we came across the website camidecavalls360.com. Finally we decided to ask for an offer just to compare it to our planning. To be honest the prices would have been almost the same, but booking with the guys from 360 had one major advantage: Free transfer of luggage from one accommodation to the next. Mountain biking Menorca – booked! Menorca has a (guess what!) typical mediterranean climate. If you prefer sunny weather for biking go there between end of May and beginning of October. In the North of Menorca the Tramuntana brings a dry and sometimes cool breeze, while in the South it is not that windy and usually a bit warmer. Independent from where you fly, you will most likely arrive at the airport of Maó (or Mahon). If not – you are on the wrong island! More Airlines can be found here on wikipedia. Maó (Hostal Jume): Tidy rooms and the hotel has an underground parking for assembling and disassembling the bikes. Even though some were pretty short, which is the reason for the title of our video. Arenal dén Castell (White Sands Beach Club): Beautiful hotel with a private beach and a nice swimming pool. Wifi costs extra. Ferreries (Loar Ferreries): Just a hotel. Ciutadella (Hostal Ciutadella): Good home base to walk and explore the city of Ciutadelly. Santo Tomàs (Hotel Hamilton Court): Spacious rooms with an own small terrace. Overall the places we stayed in were all clean and had comfortable beds. We always found a place to lock the bikes safely – but remember to bring your own bike locks! Just like on Gran Canaria you get along with English quiet well, but in the remote areas it is good to know Spanish even though the official language is catalan. Knowing greetings and basic questions (and answers!) increases your travel comfort significantly. Moreover, the locals really appreciate your effort. Here you find the basics in Spanish for your next mountain bike holidays. At some places breakfast was included, at the others we had freezers and a kitchen. We bought water and supplies for our day trips in local supermarkets that are easy to find in pretty much every town or city. To fill up our energy storages in the evening we had dinner in various restaurants. Our special recommendation for Tapas and Pomada (Gin with fresh handmade Limo) is EL ROMERO in Maó. Beforehand: we are not advertising for the 360-guys here. But we have to admit it was very comfortable to receive reliable GPS-tracks and an everyday briefing about the track section of the next day. At the top of this page you find a link to the GPS tracks we recorded on our tour. We surrounded the island in 5 sections. You could walk the Camí de Cavalls on different and sometimes parallel paths, marked by small wooden signposts almost every 2 metres indicating your position in case of an emergency. It is almost impossible to get lost. A perfect start to get a feeling for mountain biking Menorca. Starting in Maó we biked to the east coast passing the town Es Grau. Always sticking to the Camí we meandered our way up north until we reached Arenal d’en Castell accompanied by amazing scenery. A tough section with steep and rocky uphills where we had to push the bikes often. In order to see one of the watchtowers (and get ice cream) we cycled up to the northern tip of Fornells not far from Arenal d’en Castell. Be aware of the waste bins on the promenade, they attacked Dustin without any warning! Stupid waste bins! We continued a few kilometres along the northern coast and turned land inwards towards Ferreries. On our way back to the north coast of Menorca we decided to pedal up the 264 metres to the Castillo de Santa Águeda. Rewarded with a grandiose view we enjoyed our second breakfast, before shredding down to sea level again. During our tour briefing the guides warned us, that the part at the northern coast is hard to cycle. And they were right, it was definitely the hardest part during our holidays in Menorca. At Cala Morell we were lucky to find an open store to hide from the sun and to refill water. Totally exhausted we arrived at Ciutadella. 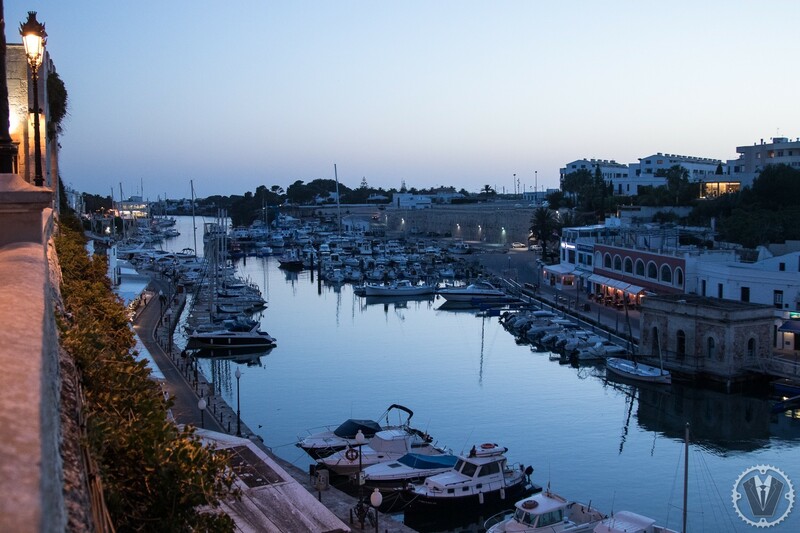 The plan was to relax one day in Ciutadella de Menorca. Unfortunately Daniel caught a man-flu (very serious of course!) and spent the day in bed with a fever. Luckily you can get really hard medicine in spanisch pharmacies. Next day he was back on the bike. True, the drugs cured Daniel, but the displeasing side effect was a lagging reaction. He said it felt like seeing rocks and roots after you already biked over them. After a bath in one of the Calas at the south coast he could wash it off. At the same day Dustin got the man-flu and precautionary took the same drugs – with the same side effects. Funny! Certainly the tour was one of the most scenic and beautiful for mountain biking Menorca. Characterized by changing landscape and different tracks we enjoyed every piece of it. Our last section back to Maó was dominated by rock gardens made of coral stones. That day we had the first flat tire just 5 minutes after departure. It seems like the majority of the Camí in the south is dominated by sharp-edged coral stones which made it really hard to cycle. Even in flat terrain we had to pedal like going uphill. As a last touristic highlight we visited the white town of Binibequer, before biking back to Maó where we started our adventure around Menorca. The wooden sign posts of the Camí de Cavalls are great fitting stands for repairing flat tires. Beware of waste bins on promenades, they can become very aggressive, always keep an eye on them (here you can read more about the incident). Spanish medicine works perfectly against man-flu, but the side effects lower your “mountain biking Menorca”-performance. Never argue with a taxi driver who tries to scam you! We did, and got detained at the airport by the police. Luckily we could explain the situation on half English half Spanish. Without some pieces of Spanish we would have never caught our flight back home and had most likely ended up in jail. Read the full story here. We did not expect the Camí de Cavalls to be so exhausting. The short, but steep and rocky uphills were very demanding. Okay it is called “mountain biking”, but mountains are not mandatory as we experienced on Minorca. 190 km and 2400 metres of climbs including technical sections, forests, awesome coastline tracks and about 200 beaches. The scenery was amazing and we even rode some parts on northshores. Taking our Enduro bikes for the trip was a good decision. Firstly, because the rentals we saw on the islands were all hardtails in mediocre condition. Secondly, because we would have had pushed or carried even more than we did. Feel free to contact us for any support you need. Mountain biking Menorca on the Camí de Cavalls is a great experience!